// Trace to show the delay due to duty cycle. And if the delay is due to txbeg then you will be able to track where it come from. You’re not seeing this when not sleeping at all, right? I fancy, I need to go back two steps here at least checking more basic things. I have to admit, I never let the “same” code on the same node run for long without the sleep. Did not feel the necessity, though it seems to be better now. I have now set up a very simplified node, sending 2 bytes every 5 minutes not getting downlinks. First test will be with a delay(2000), 150 times between the sends. No sleep and no tinkering with the timer. Here I am a bit at a loss. How do I get the LMIC_DEBUG_PRINTF to put something out to serial? I can increase debug_level to 1 which gives me out of memory in variable space. Bad. So I changed most of the #if LMIC_DEBUG_LEVEL > 0 to #if LMIC_DEBUG_LEVEL > 5 just to make them not print. Now it compiles, but nothing of the PRINTFs is sent to serial. Or you can replace the LMIC_DEBUG_PRINTF with some Serial.print(). OK, got it. Thank you a lot for helping me here. Btw: I did some other test. If I send packets with a payload of 25 bytes as fast as I can, the LMIC soon delays it to 12 seconds between the packets. They have an airtime of about 100 ms, so that’s about 1% airtime. Now, reverting to one send every 5 minutes without sleep, I can sit and wait what happens. After having run some code for 6h and 9h respectively, I have more information but nothing conclusive yet. So, rollover happend, first for now, then for txbeg. No problem so far, as still no send delays. Next test will be sending not every 5 minutes but every 1 hour. Maybe this causes the problem to show up. I don’t know if rollover occurred yet; it seems the debug print is just thinking it’s a signed value, rather than an unsigned value. For an unsigned number, the value seems to have passed half its maximum then. But sure: at some point it will rollover. Are all times in each line divided by OSTICKS_PER_SEC? // the HAL needs to give us ticks, so it ought to know the right type. Are all times in each line divided by OSTICKS_PER_SEC ? Yes, all are divided by OSTICKS_PER_SEC. Regarding the negative numbers. Next time I stop the script, I will check if I can/have to cast some printouts as unsigned long not to look different because of them flipping over to negative. Time seems to be, well, running very slow or even backwards in between. And all of a sudden, tx is after now and it delays. If I do not try to give it back all the time it slept, but only just enough so that the duty cycle is within limits (e.g. 1 minute per send or per hour, probably 10 sec would also suffice), it seems to run nice. I know this is just a nasty patch, but unless somebody has a good idea what causes these time-effects, I am lost in getting it fixed properly. As an aside: at least for EU868, it seems the value for tx at 8 is taken from the earliest time any of the channels is available, which indeed can be in the past. So that looks okay. Time seems to be, well, running very slow or even backwards in between. os_time is based on millis, it is a scaled down version of millis to avoid to overflow too often. To keep the os_time counter accurate, it needs to detect millis overflow, which happens after approx 71 minutes. The detection algorithm looks at a flip of the most significant bit of millis. Now if you sleep one hour, most of the time (1 out of 6) you will have a millis overflow, and it won’t be detected as the increment is big enough to keep the msb unchanged! This is not a proven theory, it is just my gut feeling reading the code, but you could validate it easily by calling os_getTime() each time you wake up (every 2 secs) to allows overflow detection. The thing is in non-hardware sleep, you would just re-schedule a task, not slepping. But we see that in the 5 min test the clocks are behaving better because we call os_getTime() more often. Often people need a loop to sleep repeatedly to achieve longer times. The code you quoted is essentially the basis for my code and it works as long as the total sleep time between sends does not exceed a certain limit. This limit is based on the explanations from @Amedee in the previous post. I will summarise my findings in a separate post now. Ok, after doing more testing I think I got a pretty good and complete picture of what happens and how to avoid it. Actually @Amedee hit the point brilliantly well by analysing the os_time counter and the os_getTime() function. Sleeping the AVR works well if os_time is kept accurate, which can be achieved by calling os_getTime() regularly. As he explained, regularly means at least about every 30 minutes. More often is better. Contrary to what I thought, calling os_runloop_once() does not update os_time whereas doing an actual send does. Hacking the times is also only neccesary if the tasks between the sleep does not exceed the time required for the duty cycle anyway (rarely, I guess). The full procedure with updating time0_overflow_count and timer0_millis in atomic mode is not needed. The simple timer0_overflow_count hack with disabled interrupts (cli, sei) is sufficient but will make your millis() lag behind. Should not matter except for special cases. If you put the AVR to sleep forever and wake it by interrupt, do not modify the time by more than 30 minutes afterwards regardless how long the sleep was. Better only add e.g. 1 minute which is sufficient for the duty cycle, do the os_getTime() and you are good. Adding e.g. 60 minutes at once will give you problems from time to time. You can put the AVR to sleep as short or as long as you like. You should add only limited time (minutes!) to timer0_overflow_count after sleep. Always call os_getTime() after modifying timer0_overflow_count to get the os_time updated. You do NOT need to call os_runloop_once() after waking as it does “not do anything helpful” at that time. Many thanks to all of you helping find these nasty send delays and get this sorted out. This really is a forum with brilliant, knowledgeable and helpful people being around! * arduino-lmic/project_config/lmic_project_config.h or from your BOARDS.txt. Hi, i tried your sleepmode and it worked perfectly. But i have a question about the battery measuring. What numbers do you get for analogRead(A0)? I am trying to debuggin, thats why i need some numbers i can compare with. What numbers do you get for analogRead(A0)? Hi, you should get values around 1024 with your setup on the arduino pro mini (3.3V*(10 kOhm/30 kOhm)*1024/1.1V) if VCC really is 3.3V and you use the 1.1V reference setting using analogReference (INTERNAL);. If you keep the default, or analogReference (DEFAULT); external VCC (3.3V) reference, you should see about 340. I typically use the default reference (VCC) as I usually drive the Arduinos by LiPo Battery with a regulator or with an upconverter from an AA-Battery to 3.3V which for my purposes gives me sufficiently precise 3.3V to get me something to measure the Battery (or solar cell voltages) against. See http://www.gammon.com.au/adc for details on the ADC and reference voltages. As Amedee says, if you use e.g. 4.1 V on VCC and use a regulator, you will see higher values, or in your case still 1024. 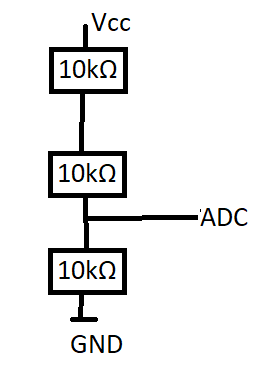 However, depending what your needs are, the 30 kOhms you have between VCC and GND might drain your battery (if you are running from battery, of course) unnecessarily as it will add another 100 uA of wasted amperage which sounds not like a lot but actually is compared to a bare sleeping Pro Mini (without LED and any sensors attached). If you have the Power-LED still connected (ca. 2 mA) , it does no longer matter. Having said that, this is why I love the jeelabs-setup I mentioned in my code example. (https://jeelabs.org/2013/05/16/measuring-the-battery-without-draining-it/) using 2x 10 MOhm resistors (or anything below but the higher, the better, if you don’t have 10 MOhm resistors) and a 0.1 uF capacitor in parallel from PIN to GND a lot better than 10 kOhm Resistors. This saves you a lot of power without degrading precision for just measuring the battery voltage. With a 1/3rd divider and 1.1V reference you will max out unless you feed less than 3.3V, and you will waste power. Yes, if you want to measure VCC and power directly into the VCC Pin (not using the regulator, otherwise it is essentially pointless as it is “always” 3.3V). No, if you want to measure VBAT or anything else like I wanted in my example.